Super cute holiday moment | spifftacular. Let’s set the scene: Dave and I just finished a satisfying lunch of Auntie Anne’s pretzels, which we had enjoyed on Penn campus. We waited at the corner of Walnut and 34th. The light turned to “Walk,” we kissed goodbye, and parted–Dave headed toward Penn campus, and me toward home. One minute later, I spontaneously decide to stop in at the GAP down the street for an undisclosed holiday-related purpose. I spend a minute or so perusing merchandise in the far corner of the store, then turn to go. As I turn, I see it in a flash: my husband. The husband that I just kissed goodbye approximately two minutes and half a block ago. Me: So, what might you be doing here? Dave: Um…disregard everything I just said. Me: Wow. This is awesome/hilarious. Um…I think I should go now. Dave: I think we should both go. And pretend this never happened. So there it was, we were both caught shopping for each other. It’s kind of a goofy, less depressing version of the infamous Gift of the Magi story. OK, so it’s only vaguely like that story. Anyway. That is your precious romantic holiday moment of the day. Enjoy! Speaking of romance, there are few things more romantic, nostalgia-inducing, and delightful than the city at Christmastime. 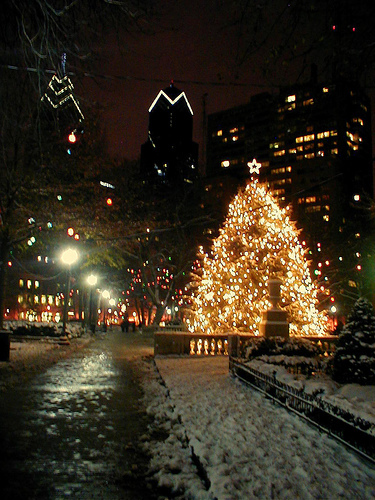 I just spent the evening shopping at Rittenhouse Square, and tonight was the night that the Rittenhouse Christmas tree was officially lit (lighted?). Christmas music was playing on the Square as I bustled along the sidewalks with my bulging bags of goodies, and I felt like the words of the song “Silver Bells” had come to life around me. As I walked home, I was elated to notice that the twinkling lights on the Cira Center, a few blocks from our house, glowed with stripes of red and green lights. It was simply magical. Hey, I didn’t know you had a blog! (saw your link on Facebook, yep I was stalking) Can I be a blog stalker, too? You know I love your writing and I just like hearing what you’re writing about. Love you!